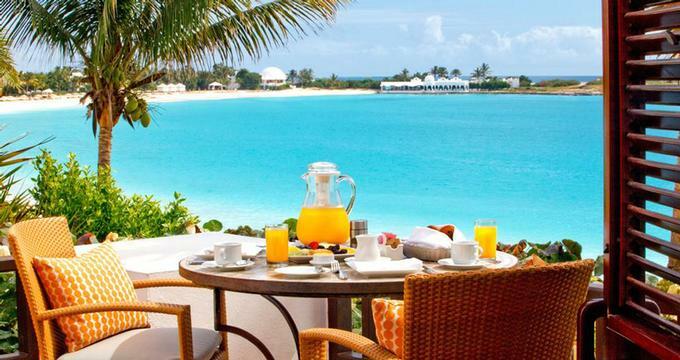 If you are wondering where to go on your next tropical escape, take a look at the sandy beaches and stunning architecture at Cap Juluca in Anguilla. The property is a Caribbean classic, featured in countless magazine articles and best of lists. Vacationers love being just steps from the clear Caribbean sea and find the Moorish architecture a unique fixture in the area. All of the guest rooms are luxurious and spacious, equipped with 40-inch TVs, free internet and crisp Frette linens. If you are looking for five star luxury, you can't go wrong with this resort. Accommodations range from specious beachfront rooms to ultra luxurious villas with private pools. Standard amenities include a covered terrace where you can have your morning breakfast with a view of the sea. With 700 square feet of space, standard rooms feel more spacious than many hotel suites that we've seen. One of the favorite relaxation spots is the hammock with a view of the beach where you'll be surrounded by ocean sounds and fresh sea air. Junior Suites are a good mid-range option price-wise, offering luxurious bathrooms with inviting tubs. The suites and villas offer families plenty of space and two covered terraces (three in case of 2-bedroom suites). Once you are done having fun swimming, snorkeling and kayaking, you can return to your plush suite for a bath and a nap in the hammock before heading out to dinner. The pool villas offer 3,600 square foot layouts and full service kitchens where a private chef can prepare a special meal for you and your guests. The dining room has a domed ceiling and provides a sophisticated dining experience. Double-tub bathrooms are especially fun for couples on their honeymoon. The villa has three bedrooms, some with private entrances so that you can come and go as you like. The property has several restaurants serving both Caribbean and international cuisine. Pimms has won several awards and offers a great selection of wines. Blue is a great place to go if you want a view of the beach. Maundays offers live entertainment and gourmet dishes. If you are looking for a casual spot, visit Spice. Couples and honeymooners can request a private beach dinner, a great idea for a romantic proposal or an anniversary celebration. Families enjoy in-villa dining because kids can go to bed right after while parents enjoy the spacious living room and outdoor terraces.